What Is It Like To Go On Tour? When you go to a concert and see the artist perform on stage, you are only getting a glimpse of their entire day. Before ShatterRed became an active band, I went to literally dozens of concerts as a fan each year, and I had a lot of ideas what it might be like to go on tour… but when I actually did go on tour, I found out that most of my assumptions about tour life were very wrong! It’s not quite as you would expect. 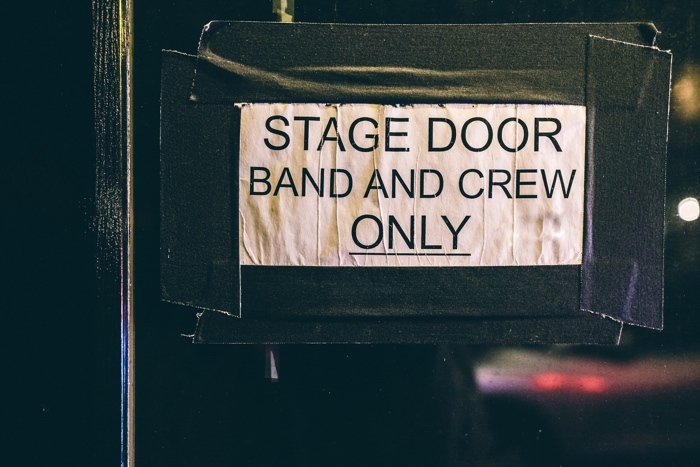 So, to shed a little light on what really happens in the life of a band, we decided to start a blog post series, called “Band Life: What’s It Really Like?” — this is Part 1 of that series. A lot of people think that bands play a show and then go to their hotel room afterwards to sleep. While sometimes this can be the case (if they’re playing at the same conference the next day for instance), most often this is extremely rare. Usually, there is another show in the next city the following day, which means you need to pack up and drive away as soon as possible. In an ideal world, you fall asleep and wake up in the morning at your next destination. In a less ideal world, something goes wrong or you have an extra long drive, and you barely get to the next venue in time for a sound check. 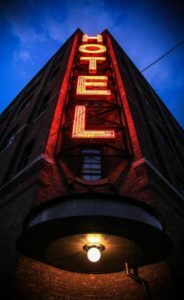 What are hotel rooms really used for? Showers. Showers are very tricky on the road. In order to get one, you either need a hotel, a friendly person to let you into their home, or a gym membership. Very occasionally, a venue will have a facility with a shower, but most often, we only get one of those three options. Sometimes there’s no gym nearby. Most often you don’t know anyone in the area with a house with a few showers. So usually, it’s off to the hotel for a shower. You’re in for about two hours and then you’re back on the road. Sleeping in a tour bus is very fun… for about the first three days. No matter how cool having a bunk bed on a massive moving vehicle sounds… you’ll get better sleep if you sleep in a bed. A bed that is long enough so that you don’t need to bend your knees. A bed where you can sit up without puncturing your skull. A bed that has more than 2 inches worth of mattress. A bed that doesn’t move (and vibrate). However, it is definitely a worthwhile experience, and it sure beats traveling in a van! There’s a small lounge in the back where we always played either trivia games or FIFA on X-Box 360. You could brush your teeth in the small sink and then just hop into bed. Fortunately, the bunks, being blocked off by a door in the middle of the bus, were often sound proofed well enough, and people could finish up a movie in the front lounge without bothering the sleepers all too much. It’s happened to me before. I’ve been there at a concert in my home town, really excited that the artist graced my city with their presence…. and then…. they say “it’s great to be in…” the wrong city. It’s happened more than once. Believe it or not, it iS a little bit tricky to tell where you are when you’re on tour! Sometimes you’re just sleepy and you may not be remembering correctly. But sometimes, you wake up in a new town (one out of ten on a ten day tour) and you simply have no idea where you are unless you look at the schedule! And thankfully, we were able to keep on schedule pretty well. 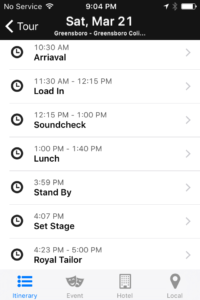 Our road managers would always plug the full daily schedule into a smartphone app called Master Tour. It’s pretty cool; you can see a screenshot to the left. Our road manager would outline the full schedule for the day as well as other details like flight numbers, names and phone numbers of contacts at the venue, and (most importantly) the wi-fi password. This was great because it meant that we didn’t need “day sheets,” aka pieces of paper with all of that information that you had to keep all day. Instead, the app let all of this information stay on our phones so we always knew what was going on. Were you surprised by any of these insights? Did you already know some of this? Do you think you would enjoy being in a band?